The Lorentz Center (Leiden, The Netherlands) is well known for providing a special environment for scientific collaboration, and is therefore booked long time in advance for workshops for which grants there is a strong competition. The participants of the week-long workshops are provided with an office space – to be shared with 2-4 other participants. Coffee, tea and juice are available in the light common room, whiteboards can be found every where. 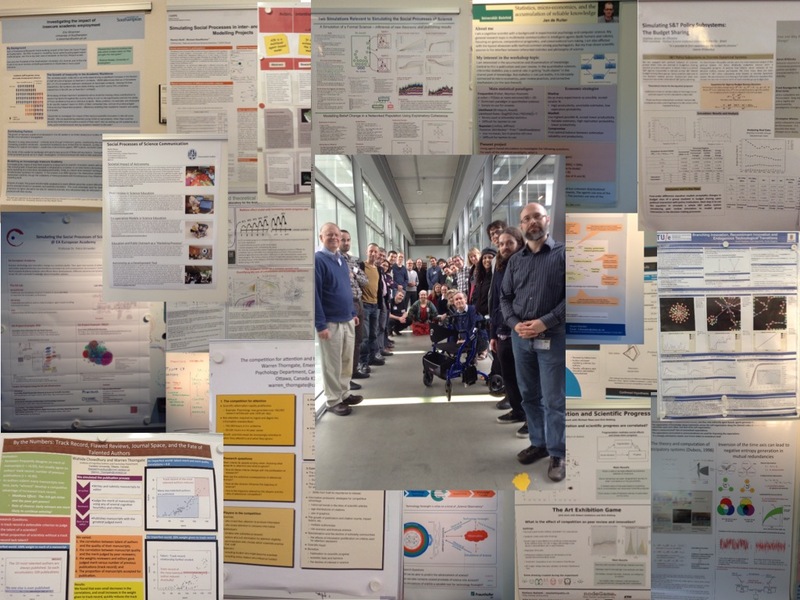 The long corridor can be turned if needed also into a poster gallery (see picture). A newly equipped lecture hall at one end of the floor, a local team of organizers second to none, a traditional boat trip through the Dutch polder around Leiden – all this contributes to an relaxing, comfortable and inspiring atmosphere. In the design of the programme only few slots per day were fixed for oral presentations, and ample time was reserved for brainstorm and hands-on work (for the final programme see http://simsocsci.blogspot.nl/2014/04/wednesday-morning-version-of-timetable.html ). I found it amazing with which dedication and self-organized manner the participants engaged with this open programme, and how seriously the open time spaces became more and more filled with concrete research projects. 2. A mailing list was started. 3. The to-do list for after the meeting contains activities such as: a follow-up meeting 2016, publication(s), mapping model exercises, implementing of different models in NetLogo, and many more – all come with names of persons taking the lead and responsibility (see http://simsocsci.blogspot.nl/2014/04/a-list-of-actions-decided-at-plenary.html). Of the about 40 registered participants – for only 14 of which TD1210 provided a grant – each day more than 30 signed the attendee’s list – even on the last day! About a third of the participants were female and at least one third were Early Stage Researchers. Local colleagues connected to our Action – such as Paul Wouters, director of the well-known CWTS, and Diego Garlaschelli, Professor at the Lorentz Institute for Theoretical Physics in Leiden; as well as Janusz Holyst, currently fellow at NIAS took the liberty to bring (local) students and younger colleagues to this event. 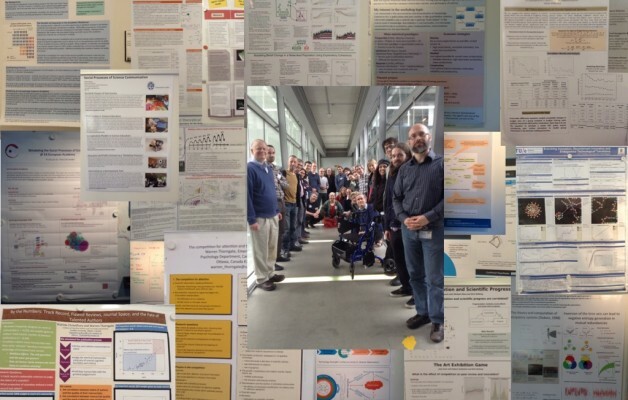 This workshop opened the collaboration with another – newly started – COST Action PEERE (New Frontiers of Peer Review), with which we share engaged members, and to which in particular from out our WG 2 exist strong links method-wise. Consequently, the follow-up meeting for the SSPoS workshop is planned as a mutual event in 2016. The workshop revealed the diversity of model approaches as well as the diversity of epistemic functions of those models. This variety entails data-driven and data-based modelling as well as to the use of mathematical models to foster thinking and to deepen understanding of the social and cognitive processes of science. The two keynote talks of Katy Börner (IU, Bloomington, US) and Paul Thagard (Univ of Waterloo, Canada) framed the workshop along those lines. Maps – Knowledge Maps – were present at the workshop in various functions: participants marked their journey and research interest on Brian Castellani‘s map on sociology and complexity science, ideas to map the landscape of science models where exchanged and models used and produced maps of information seeking behavior.